Our Raptor Interpretive Program offers an inspiring way to learn about birds of prey, including: falcons, hawks, owls, and eagles. You’ll get an up-close experience with a raptor, presented by museum personnel. Raptor presentations are included with paid admission; free for members. Spring/Summer hours of 11 am and 2 pm presentations are everyday. Times can vary slightly because we provide raptor presentations for group tours, so if you are planning your visit around the raptor presentations, we invite you to call ahead to confirm the day’s upcoming schedule. Call 541-296-8600 ext. 201 if you would like more information. Fall and Winter hours are 11 am and 2 pm Saturdays and Sundays. Bambi Foy displays the Bald Eagle. 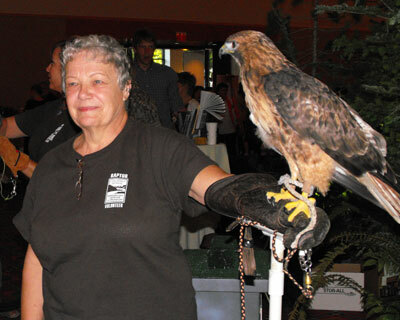 Linda Davis shows the Red Tailed Hawk at the 2013 International Montessori Conference in Portland, Oregon. 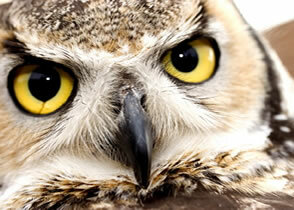 The Columbia Gorge Discovery Center’s Raptor Program will introduce you to live birds of prey. Adults and children of all ages will enjoy learning about the unique attributes of each fascinating raptor species. Programs address the challenges of declining habitat, the hazards of toxic chemicals, and the role humans have played in both endangering and protecting these majestic ambassadors from the wild. The live raptor presentations are included with paid admission; free for members. Jean Cypher, D.V.M. 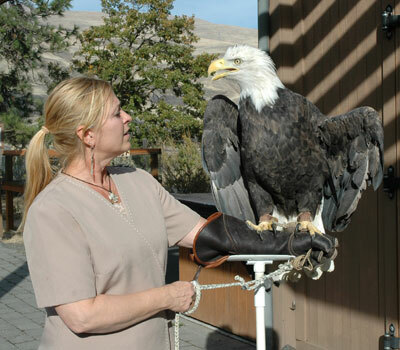 of the Rowena Wildlife Clinic, called in Spring 2007 to see if the Discovery Center would be interested in having a bald eagle to display. With the assistance of the Discovery Center administrator, Dr. Cypher, Chris Tolotti of Wildlife Rescue of the Gorge, U.S. Fish and Wildlife Migratory Bird Division, and Oregon Fish and Wildlife Department, the idea for a full-scale education and exhibit project evolved. The program meets several needs. It affords the clinic an avenue for educating the public about native raptors and their habitats, provides a place for non-releasable injured birds that must otherwise be euthanized, and offers the Discovery Center a program that meets its mission to inspire appreciation and stewardship of the Gorge. The bald eagles are strictly exhibition birds, allowing the public a relatively close view of a very large raptor. Its 24’x48’ enclosure allows room for exercise, although their permanent wing injuries prevent them from flying. In addition to the eagle exhibit, several education birds are on site include a great horned owl, an American kestrel, a rough legged hawk, a Cooper’s hawk, and a red-tailed hawk. 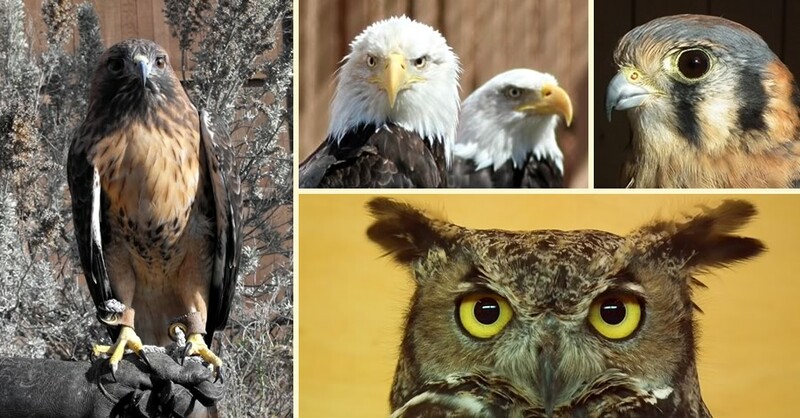 All of these birds are the property of the federal government held under permit with Oregon Department of Fish and Wildlife and United States Fish and Wildlife Service. The Discovery Center’s Raptor Project receives funds solely from donations, program fees, and grant support, all of which go directly to the care and maintenance of the raptors. In order to expand the public’s appreciation and knowledge of raptors and to help fund the stewardship of the birds, you can symbolically adopt a Discovery Center raptor. A Raptor Adoption makes a great gift for the animal lover in your life! Click here to learn more. If you adopt a raptor you will be invited to come spend a little time with them. You’ll learn their secret name, and learn more about their daily lives. To make a tax-deductible donation, click here.